Filled with light and color, this vibrant tapestry "Wooden Doorway" shows a gorgeous wooden door decorated by vines and flowers. The sun is casting a gorgeous light on the white wooden door and is also playing with the texture of the rustic sandstone walls. The window above is open, and is hinting that someone is home. A charming work showing the beauty of village life. 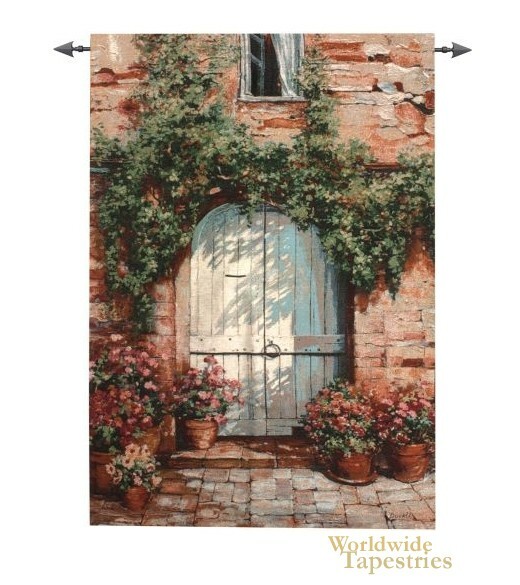 This cityscape tapestry "Wooden Doorway" is backed with a lining and has a tunnel for ease of hanging. Note: Tapestry rods, where pictured, are not included in the price.